The patella (derived from latin means 'small plate') is a flat, inverted triangular bone, situated on the front of the knee-joint. it's composed mainly of dense cancellous tissue. It has an anterior and a posterior surface, three borders, and an apex. The subcutaneous anterior surface is convex in all directions, perforated by small apertures for the passage of nutrient vessels, and marked by numerous rough, longitudinal striae. This surface is covered, in the recent state, by an expansion from the tendon of the Quadriceps femoris, which is continuous below with the superficial fibers of the ligamentum patellae. It is separated from the integument by a bursa. 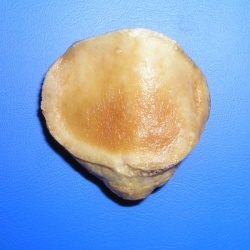 The posterior surface is covered with articular cartilage upto 4 to 5 mm thick. This helps in dissipation of the force. It presents above a smooth, oval, articular area, divided into two facets by a vertical ridge; the ridge corresponds to the groove on the patellar surface of the femur, and the facets to the medial and lateral parts of the same surface; the lateral facet is the broader and deeper. 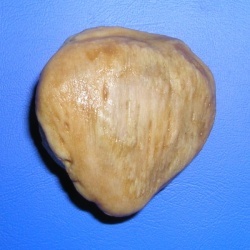 The medial facet shows significant anatomic variation. The 3rd odd facet exists along the extreme medial border of the medial facet. The base or superior border is thick,rough and sloped from behind, downward, and forward: it gives attachment to that portion of the Quadriceps femoris which is derived from the Rectus femoris and Vastus intermedius. The medial and lateral borders are thinner and converge below: they give attachment to those portions of the Quadriceps femoris which are derived from the Vasti lateralis and medialis. The patella consists of a nearly uniform dense cancellous tissue, covered by a thin compact lamina. The cancelli immediately beneath the anterior surface are arranged parallel with it. In the rest of the bone they radiate from the articular surface toward the other parts of the bone. The patella is ossified from a single center, which usually makes its appearance in the second or third year, but may be delayed until the sixth year. More rarely, the bone is developed by two centers, placed side by side. Ossification is completed about the age of puberty. Functions primarily as an anatomic pulley for the quadriceps muscle.It increases the lever arm of the extensor mechanism allowing for more effective knee flexion and thus increase quadriceps strength by 33–50%. Earlier, patella was considered to be a frictionless pulley, in which the force of the patellar tendon equals the force of the quadriceps tendon. However, recent studies have shown that the patella acts more like a balance beam, adjusting the length, direction and force of each of its arms- that quadriceps tendon and the patella tendon- at different degrees of flexion. With increasing flexion, the patellofemoral contact area moves from distal to proximal on the patella surface. This change in contact area results in a change in the lever arm and mechanical advantage provided by the patella to the quadriceps. Interposed between the quadriceps tendon and the femoral condyles it acts as a “spacer” and protects the tendon by reducing the friction and compressive stress and minimizes the concentration of stress by transmitting forces evenly to the underlying bone. ↑ Levangie PK, Norkin CC. Joint Structure and Function : A Comprehensive Analysis. 4th ed. India: JAYPEE; 2006.